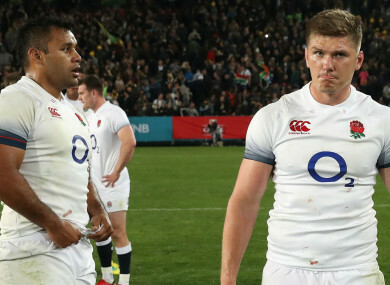 Owen Farrell has come in for criticism since the draw with Scotland, but Billy Vunipola says it’s unwarranted. England duo Owen Farrell (right) and Billy Vunipola. Head coach Eddie Jones replaced Farrell, sole captain in the absence of Dylan Hartley, and said the out-half had “lost a bit of his edge” after Scotland roared back to retain the Calcutta Cup. He added: “It was only a few weeks ago that he was one of the best [out-halves in the world] and now obviously we have one bad half and now everyone’s questioning: is he still our captain? Vunipola was speaking at a coaching session he was leading with fellow Saracens and Harlequins players on behalf of Land Rover at Beaconsfield RFC. Email “'One bad half and now everyone's questioning' - Vunipola defends captain Farrell”. Feedback on “'One bad half and now everyone's questioning' - Vunipola defends captain Farrell”.